do i need to pull valve cover and retime again? could it have moved when i loaded up cct? Did you rotate crank to tighten pulling side of chain before releasing CCT? Or rotate cam backwards slightly? You need pulling side of chain fully tight and CCT side loose before releasing CCT. If both sides of chain are evenly loose, the CCT will tend to pull cam backwards when released. no i didn’t do this. of all the reads on this i didn’t see this or i missed it. thanx for the info. so pink mark must align with the little metal tab? if i do the rotate cam backwards would alignment dots be slightly up or down? Last futzed with by maverick9611; October 12th, 2017 at 02:31 PM. is your cam timing out of phase? i don’t think so. the diy pic looks like similar to my cam phasing. Any Kaw I've *ever* done..the cam timing is situated per the drawing. Note on drawing the arrowed timing marks are situated to the FAR left and right. Yours *between*. did you look at the diy pic? it looks exactly like mine. obviously the paint marks are wrong. the painted above the ex line and below the in line. 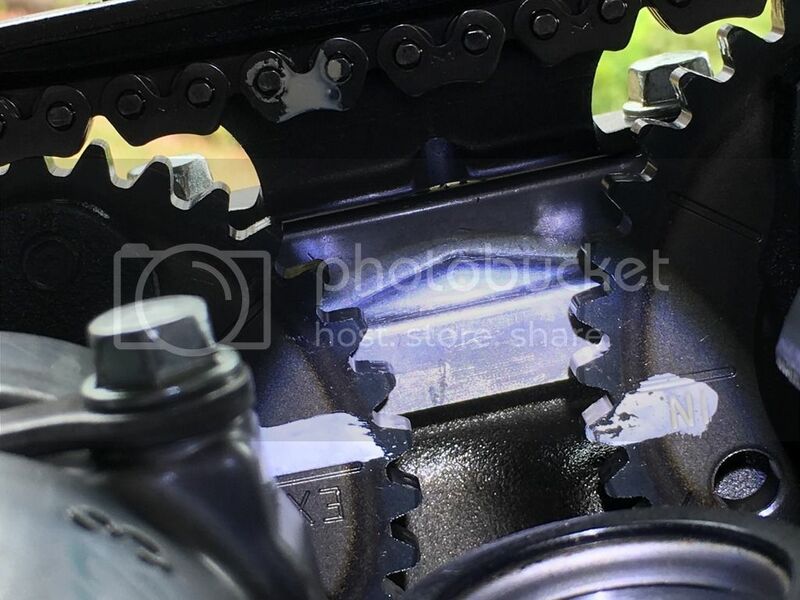 i’m looking at the actually lines on the sprocket. your newgen timing position is completely different to earlier, traditional cam timing I'm familiar with. There is a old 2008 valve clearance thread by user "Vex" , mentioning the timing mark apparently being off too, similar to your situation ...found in a google search.. Disregard my comments, I'll sheepishly return to the carbs I'm working on. 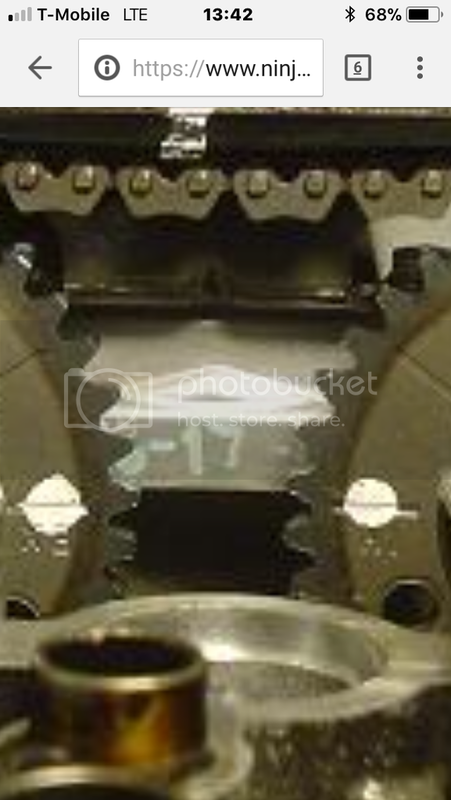 I just went through this doing my first valve adjustment, it looks like the cams may or may not be a tooth off but the problem is having the chain slack on the wrong side of the crank when the cct is reinstalled. If the slack is on the opposite side of the crank it will spin the crank to take the slack out. after searching for hours. finally found this via google search. 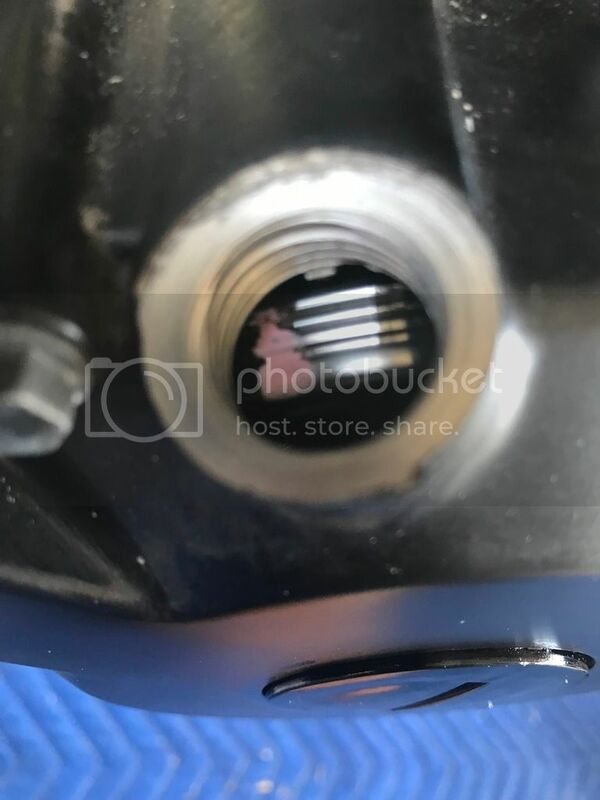 the how to valve adjustment with pictures needs to be updated with this post to get proper valve timing.